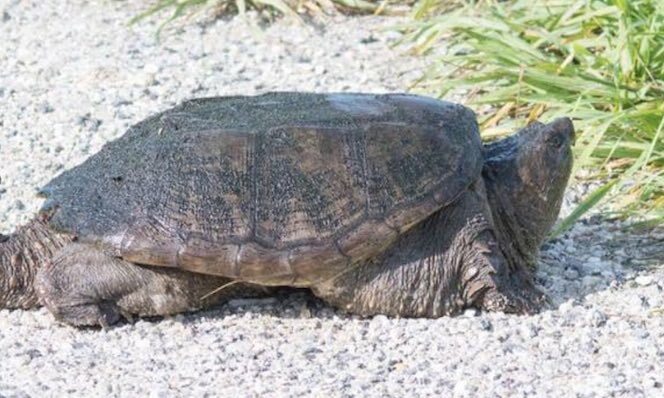 A snapping turtle, which is scientifically known as Chelydra serpentine, is also often called the common snapping turtle. New Yorkers will surely recognize this as it is the official symbol of their state. While a snapping turtle can be taken care of as a pet, this is not advisable for beginners. You need to exert quite an effort and spare a lot of time if you want to have a snapping turtle at home. They are high maintenance and have very demanding needs, so you must be prepared. In some areas, these turtles have legal protection, so check first from your place if you need to secure a permit. If there is one thing that snapping turtles are known for, it would be their size. This is also the reason why it is challenging to have them as household pets. The length of their carapace can reach up to 20 inches. More so, those in the wild can weigh as much as 75 pounds. Snapping turtles are quite easy to recognize because of their physical characteristics. Their color and markings, however, will depend on their breed. Their colors can be olive, black, brown, and cream. There are black pigments that can be seen on the surface. They are also known for having noticeably large heads, muscular limbs, long claws, and webbing toes. The name of the turtle is derived from its behavior when it is eating. Slowly, the turtle will approach its prey. Once it has got hold of its victim, it will lunge on it quickly. The prey can disappear in a snap, leaving no room to defend itself from the turtle. Snapping turtles are known for being docile and calm. However, when they are disturbed, they can be quite aggressive and may turn into biting. They can viciously strike their opponents, so the highest level of care should be observed every time you are near a snapping turtle. When they feel threatened, they will lunge quickly and open its mouth to bite. Snapping turtles can be found in some parts of the United States, Canada, Mexico, and Ecuador. They are commonly found in fresh bodies of water, including lakes, rivers, and marshes. At home, one of the most important in creating a habitable environment is to use a large tank. This will provide enough room for the snapping turtle to move considering the fact that it is large. When they are adults, the enclosure should have a capacity of at least 250 gallons. Aside from an indoor tank, an outdoor pond will also be an excellent place where these turtles can thrive. Whether you house the turtle indoors or outdoors, it is important that you invest in a high-quality filtration system, which will be critical in keeping the water free of contaminants. or the Fluker’s Repta-Clamp Ceramic Lamp. The latter is an excellent choice when it comes to versatility as it can be dimmed based on the light requirements of the turtle. Unlike other turtle breeds, the snapping turtle spends most of the time in the water. This, however, does not mean that a basking spot is needed. It is still good to invest in one if in case it decides to go up for a break from the water. Your turtle will also benefit from having a substrate in its housing. Rocks and gravel will be excellent choices. Before putting the substrate in the enclosure, use a product like the Zilla Reptile Terrarium Bedding Substrate Liner. Because of the potential aggressiveness of the snapping turtle, it is better if they live in isolation. Mixing it with other species can be harmful because the snapping turtle becomes ferocious when it feels a threat. With an omnivorous diet, snapping turtles will eat both plants and meat. Some of the most common foods that they eat include water plants, snails, crayfish, worms, and insects. Commercial pelleted turtle foods will also be loved. Make sure to feed them as well with plenty of vegetables. is one of the best ways to make sure that they have the vitamins they need. 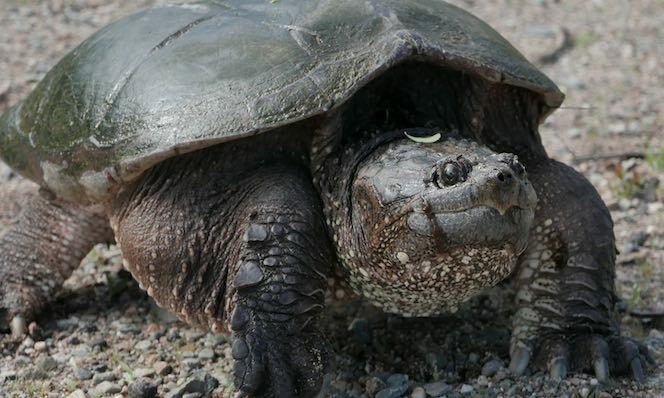 On average, the snapping turtle can live for about 30 to 40 years. Throughout its lifespan, it is not easily prone to health problems. Nonetheless, when they are exposed to contaminants and not properly taken care of, they can suffer from decreased appetite, vomiting, and lethargy. Do not overfeed the turtle. They have a big appetite and giving them more than what their body requires can result in being overweight. As much as possible, feed them only once a week. Also, if there is any excess food, remove it from the enclosure to preserve the clarity and cleanliness of the water. Ideally, the water temperature should be at 75 to 86 degrees Fahrenheit during the day. At night, the temperature can drop by as much as 10 degrees. If it is too cold, invest in a heater or warmer. With this, check out the Zoo Med Repti-Therm Under Tank Heater. Look but do not touch – live by this premise to avoid being bitten by the snapping turtle. If you have to touch it, be as gentle as possible so that the snapping turtle won’t feel disturbed or threatened.